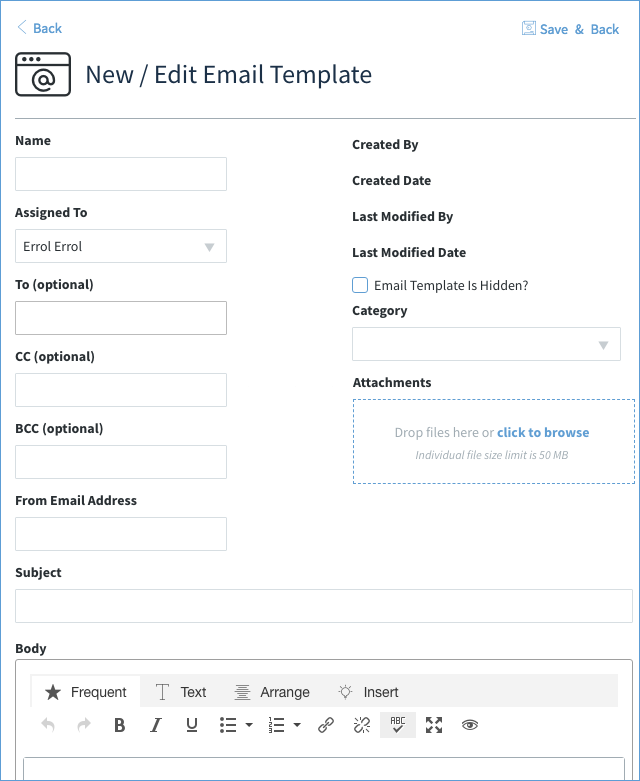 Even though Method comes with stock email templates, the whole point of Method is to tailor your CRM experience to your business practices, so we’ve included an option to create a new email template. The following steps will show you how to create a basic email template without using mail merge. If you want to learn about using mail merge, click here. 1. Click Templates on your Send Email App. 2. This opens your Email Template List, which displays all templates currently saved in Method. 3. Click New Email Template to open the New/Edit Email Template screen. Name: Choose a unique, descriptive Name (e.g. “Maintenance Notification”). Assigned To: Assign the template to a Method user. By default, this template is assigned to the user signed in. Add an email recipient (“To”), a default sender (“From”) and copy or blind-copy recipients (“CC”, “BCC”) if applicable. Fill in the Body of the email using the text editor. Email Template is Hidden: Some templates are specific to Method-generated emails (like notifications to users). Method can access hidden templates, but users won’t see it nor can they select it in dropdowns. Category: Choose a category that reflects the purpose of this template, or the department it's most likely to be used by. You can create your own categories by selecting New / Edit Template Category in the dropdown. Click Save to save your new email template.